TimeChimes Automated Audio Player 2.00 is teaching & training tools software developed by NCH Swift Sound Software. TimeChimes will play a sound or sounds at pre-scheduled times of day on each day of the week. Typically, TimeChimes can used to play school bells or shift-time sounds in factories, churches or businesses. It can also be used for other applications where you want a sound to play at preset times. Includes 9 pre-recorded bell type sounds. Supports dual week cycles. This program is shareware, which means you can download and use TimeChimes Automated Audio Player 2.00 for free during 30-days trial period. After this period you gonna have to buy TimeChimes Automated Audio Player 2.00 software for $78.00 or uninstall the program. 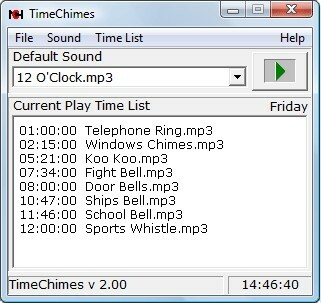 TimeChimes Automated Audio Player 2.00 supports different languages (including English). It works with Windows 98/XP/Vista. Latest TimeChimes Automated Audio Player 2.00 does not contain any spyware and/or advertise modules, allowing installing it with no worries concerning valuable information loss. We has completely tested teaching & training tools software TimeChimes Automated Audio Player 2.00 many times, written and published the interesting article and uploaded installation file (619K) to our fast server. Downloading TimeChimes Automated Audio Player 2.00 will take several seconds if you use fast ADSL connection. Play Sound provides a simple, no-fuss way to play sound files in classic Mac OS and Mac OS X. The Sound Box plays QuickTime sounds with one click.